Chilton and Sedgefield Tennis Club / First Tennis Lesson Free - All Equipment Provided! First Tennis Lesson Free - All Equipment Provided! Chilton & Sedgfield Tennis Club will be delivering their coaching program at Sedgefield Community College during the winter. All new tennis players can try their first session for free! As the weather turns we will have access to indoor facilities for child and adult coaching and will have access to floodlights every evening. All equipment will be provided if required! 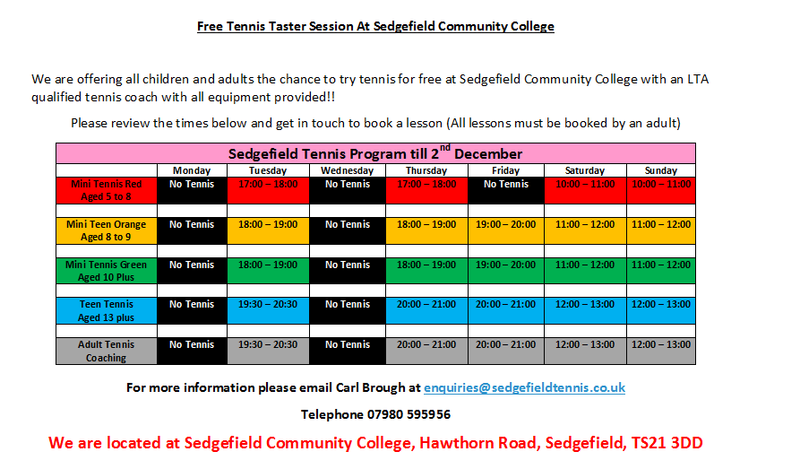 If you want to know more or book your first sessions free , please email Carl Brough enquiries@sedgefieldtennis.co.uk or telephone 07980 595956.